In the entrance of the school, clear room plans are available to provide the visitor with a detailed overview of the accessibility of the classrooms, the secretariat, etc. 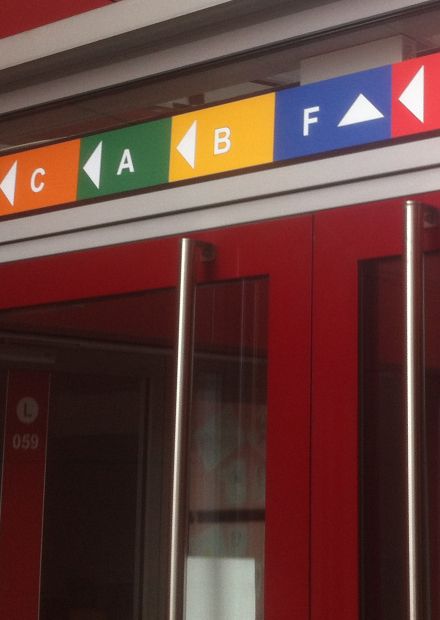 Colored marking tapes with integrated arrows at the entrance doors simplify the route to the individual colored building complexes directly in front of the building. They always provide information about the development within the respective building. These horizontal color tapes are always located in the upper door area of ​​the main inputs and usually extend over the entire input width or their glass surfaces. With a height of 15 cm (5.9 inch) they are sufficiently visible, and with their flexible width they can be individually adapted to the local conditions. The arrows are also used for other orientations within the building. This ensures a uniform appearance. In addition to the arrows, textual information can be integrated for everyday orientation, such as administration, secretarial office, or auditorium.